The dictators often feel that their rule will last forever, they will never be held accountable, people will remember and praise them forever. Unfortunately this is not the case. 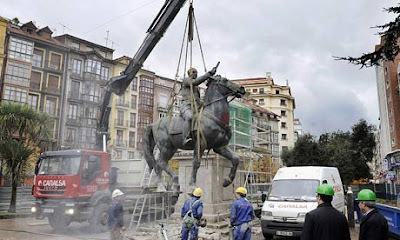 Spain's former dictator General Francisco Franco was finally knocked off his pedestal yesterday as workmen removed the last public monument to him on the mainland from a square in the northern port city of Santander. The statue was around for 44 years with Franco dead for 36 years. Sure people in Spain will consider it a good riddance. We saw a similar thing in case of Saddam who installed his own statues everywhere in Iraq probably thinking that his rule and legacy will last forever. Unfortunately for him, people took lot of delight in bringing his statues down. And we should not forget the despo called Niyazov from Turkmenistan who suffered a similar fate and is now confined to the book of ancient Turkmenistan history. Now Mugabe is doing something similar in Zimbabwe and he thinks that the country belongs to him and his rule will last forever. Meanwhile people are dying due to cholera, aids, malnutrition, etc.